Now that you have had some time to practice getting used to the water, doing bops, blowing bubbles, putting your face in the water, holding breath and relaxing, it is time we start focusing on floating. However, don't neglect the other drills if you still have some troubles. Be patient and the success will come. Think of your body as a vessel where your core goes from the midsection of your chest to right below your hips. When floating or swimming the head should be in a neutral position. By neutral, I mean ears just below the surface of the water and your eyes are facing the bottom of the pool. The back of your head is barely dry or even slightly submerged and your suit is no more than 1.5 inches under the surface. If your head is in a negative position, your chin is tucked on your chest and all the water is flowing way over your head (NOT GOOD), just relax your neck and your head will float. If in positive position the water is hitting you on your hairline or your forehead and your legs are sinking (NOT CORRECT EITHER). Always think, eyes to the bottom of the pool, eyes to the bottom of the pool or pretend like you are watching your shadow on the pool floor below you. - Now, slowly ease shoulders, arms, and hands into the streamline position (position where your arms are above your head - like you are trying to reach with both hands for an apple on a tree). Make sure you do not raise your arms out of the water though, they should rest right below the surface. Some of you will find yourselves laying on the surface of the water. This is brilliant, well done. Some of you will have your feet still dangling down, however, they should be higher than they were originally. Well done as well. It is not a problem that your feet are not all the way at the surface, you will just have to kick more when swimming or bury your head deeper underwater. Don't worry though, if your feet are not right at the surface, this could be changed by practicing more and more and learning to relax more and more. You probably ask yourselves. Wow, why is it that my feet are rising. Well, it is simple. Your body acts like a teeter-totter (seesaw) with your hips being the axis. 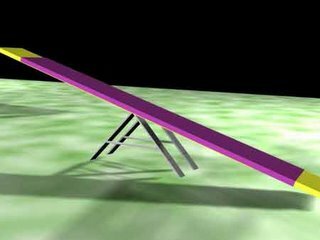 Once you get the head in neutral position then stretch the shoulders, arms, and hands in the streamlined position right at the surface, you are adding more weight on one side of the teeter totter/seesaw, so your legs will automatically rise up. I have included a picture of teeter-totter below if you don't remember it from your younger days :). me encanta el nado, lastima que aca en chile solo sea amateur. I wanted to know how often you update your blog. I took swimming lessons last summer and have been practicing at the local pool. My problem is that I only know backstroke and free style and am terrified of deep water and treading. I would like to build up the courage to dive someday. I also want to learn how to navigate my body under the water. Since I am a novice, are there any things I can be doing to help work up the nerve to do more advanced things. Also, there is a master's swim program at my club, but I am embarassed about the level in which I will be starting. I have too much muscle to float. What is the world record for swimming distance? Very nice series of articles, I hope that you'll continue with this! I'm looking forward to test it myself. Thanks so much for all your kind words about the blog and the content. I do my best to update regularly (biweekly, monthly :)), however, some months are more hectic then others with my work, so don't get as much time to update as I'd like to. 1. World record for swimming distance? - I have no clue and doubt there is one as it would basically borderline a death of a person :). However, I think there are more world records in swimming from places to places in certain times etc. Try search Google.com for more info. 3. Trying masters swimming? - don't be embarassed. Everyone starts somewhere and look at it more from this perspective: How many people out there can say, I swim on a team on a regular basis, it keeps me fit and I love it. Swim on, don't let your level of swimming stop you. Hi...its been just 2 days since i started my swimming classes. I am 27 and was told that it'l be difficult to learn compared to others. is that true? Do u think 8 classes (weekends only) are not enough to get me to swim? Also does body wieght matter? There is never too late to start to learn how to swim. If you have the dedication, patience and some body control, you can do it. Of course, the older you are the longer it takes, but at 27 you are still very young, so should be perfectly fine. You can learn to swim in 8 classes, however, it really is dependent on how fast you can learn. After 8 classes you should have enough knowledge of swimming that you can improve on your own. Weight does not really matter in swimming. If you are very muscular you will not float as well as if you have some fatty tissue, but otherwise most people float regardless. hi, my name is moses, i tarted swmming lessons less than a week ago. still iam afraid of the vdeep end. Hi moses, thanks for sharing your swimming experience. The important thing is that you learn how to float before you venture out to the deep end. After you float comfortably, floating in deep end is the same as floating in shallow end as the water is the same, so there is no reason to be afraid. You can always sink all the way to the bottom and push back up to the surface from the floor of the pool (if you happen to sink). Hi just read your blog. you have some good tips. In response to the person that asked about the number of lessons needed to learn to swim. My husband and I are both 43 and we learned to swim in three days! The lessons were one hour long and we were taught the basics and we can swim. Neither of us had ANY swimming instruction prior to our lessons. Our daughters had a week of instruction prior to our lessons and my husband observed two days and I watched our daughters five days. We had a great instructor needless to say. My husband was able to jump from the diving board on the deep end and swim almost the length of the pool at the end of the third day!! @ Cindy: thanks for sharing your experience. Well done for learning to swim in such a short time. Hats off to you and your husband. For everyone else, please note that Cindy and her husband are an exception to the rule. The time it takes to learn to swim is very individualistic, so don't assume it will take you 3 days as well. However as you can see it is possible :). Actually children find it harder, but they don't complain. Especially if they have something wrong with their bones they have to really try. Stop whining. This is THE BEST blog I have ever read on swimming..the way you explained is just like we are watching a youtube movie - so vivid, clear & accurate..I love it! I'm 45 and am a total beginner. The instructor says I'm too tense but I don't know how to relax. Floating has eluded me thus far and I'm at lesson 4 :(! Hi WIFan, thanks for your comment. There are a few things you can do to help with the tension. 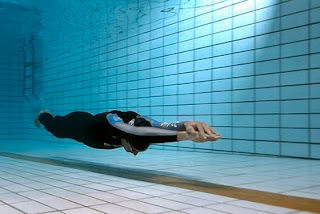 For example, you can practice in warm water, so your body naturally relaxes or start only in a shallow end by blowing bubbles and going underwater to get used to the feeling or in a kids pool where is about a foot of water, so when you float, you can touch with your hands on the bottom of the pool. Hope this helps a little.